• The DAV-HDX576WF includes both the S-AIR receiver and the wireless rear speaker package, and costs $500. • The $400 DAV-HDX277WC includes the S-AIR receiver; the WAHT-SA10 wireless speaker package is compatible, but sold separately for $150. • Also for $400, the DAV-HDX279W includes the rear speakers, but you'd have to buy the compatible AIR-SA10 S-AIR receiver separately for $120. • If you're not sure what you want at all, you can pay $300 for the DAV-HDX275 and then opt in to the S-AIR receiver or wireless rear-speaker kit later on. LAS VEGAS, Feb. 26, 2007 - Sony today unveiled four home theater systems featuring the new S-AIR™ technology, a wireless audio solution for multi-room listening. By integrating S-AIR technology into its new home theater systems, the company will be delivering a practical wireless multi-room solution without complicated set-up requirements, such as IP addresses, WEP keys and pin codes. Wireless audio can be transmitted from the main system in the living room to multiple rooms throughout the home — up to 164 feet — simply by connecting a separate S-AIR Air Station receiver/speaker into a power outlet. S-AIR technology also delivers audio wirelessly to rear surround speakers without interfering with other household devices. "From playing music to broadcasting the big game throughout the home, our home theater systems with S-AIR technology makes entertaining easy and affordable," said Brennan Mullin, vice president for audio products for Sony Electronics' Digital Imaging and Audio Division. "Multi-room audio systems typically are quite costly and need to be professionally installed. Now we have a simple, affordable alternative." The four BRAVIA® Theatre systems integrate a high-quality, five-disc DVD/CD player with upscaling to 1080p via HDMI™ when connected to a 1080p-capable HDTV set. 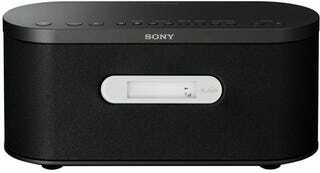 These systems feature Sony's Digital Media Port, which adds controlling, networking, and connectivity for music playback with various optional accessories. An included cradle for iPod players (TDM-iP10) connects to the Digital Media Port to wirelessly stream audio through the house using S-AIR Air Stations. Additional accessories include a Network Walkman™ player audio cradle, a PC client device and a Bluetooth® adapter (each is sold separately). Featuring Digital Cinema Auto Calibration (DCAC), the units offer simple multi-channel surround sound setup with the use of an included microphone to automatically adjusting speaker frequency, distance and level for an optimal home theater experience. Finally, the home theater systems offer a Dialogue Audio Enhancer with night mode. This adjusts for low dialogue when the receiver volume is turned low. They also come with an updated Portable Audio Enhancer, which improves the clarity and depth of a connected music player by adding information to the audio signal that had been removed during compression. The DAV-HDX576WF model includes one S-AIR Air Station receiver/speaker (AIR-SA10) and a wireless rear speaker kit (WAHT-SA10). The theater system offers height adjustable floor standing speakers designed to match the style and height of BRAVIA televisions. This model will be available in March for about $500. The DAV-HDX277WC model includes one S-AIR Air Station receiver/speaker (AIR-SA10) with an option to add a rear wireless speaker kit (WAHT-SA10, sold separately), while the DAV-HDX279W model includes the rear wireless speaker kit (WAHT-SA10) with an option to add S-AIR Air Station receiver/speakers for multi-room audio. Both of these models will be available in March for about $400. The DAV-HDX275 system is equipped with S-AIR-Ready technology with an option to add a rear wireless speaker kit (WHAT-SA10) and an S-AIR transmitter (EZW-T100) with S-AIR Air Stations (AIR-SA10). The model will also be available in March for about $300. Adding rear wireless capabilities to compatible S-AIR Sony home theater systems, the WAHT-SA10 wireless speaker kit utilizes radio frequency (RF) to transmit audio wirelessly to rear speakers, eliminating unsightly wires. An integrated headphone output allows you to conveniently enjoy home theater without disturbing others. The rear wireless speaker kit will be available in March for about $149. AIR-SA10 Air Station receiver/speakers can be purchased for use with compatible S-AIR Sony home theater systems — up to four units can be used with each theater system. The AIR-SA10 features eight watts (RMS) of power, with an alarm clock function and will be available in March for about $120. The home theater systems will be available through sonystyle.com, at Sony Style retail stores, at military base exchanges and at authorized dealers nationwide.